Synopsis- Brisbane lawyer Clare Mitchell has a structured, orderly life. That is, until she finds herself the unlikely guardian of a small, troubled boy. In desperation, Clare takes Jack to stay at Currawong Creek, her grandfather’s horse stud in the foothills of the beautiful Bunya Mountains. 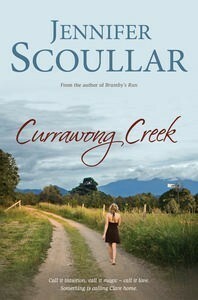 Review- Currawong Creek is Australian author Jennifer Scoullar’s second novel to be released with Penguin and while it might be a little less in the style of rural fiction as Brumby’s Run, her latest novel introduces heroine Clare Mitchell who is caught between the authentic country lifestyle of her childhood and the fast-paced urban life she’s created in her adulthood. Clare is a Brisbane-based lawyer representing the disadvantaged with a range of social issues. Eager to rise the ranks, Clare is hard-working and feeling in control of her life. Until, a little boy is abandoned in her office by his young mother and Clare is faced with the hard decision of allowing child protective services to place him in an unsuitable group home or to offer herself as a temporary carer. She chooses the latter which places her in a difficult position at work but also turns her life upside down at home. Not only has she got a 4 year old on her hands but a big bouncing dog who causes just as much havoc as her newfound parenthood. As her structured, controlled life begins to unravel, her relationship breaks down and her boss insists she takes leave’ Clare leaves behind the hustle and bustle of the city to return to her grandfather’s country home at Currawong Creek. Clare’s return allows her to breath again. Young Jack’s behaviour settles, her energetic dog has plenty of time and space to burn it off and she finds herself falling for the local vet, Tom. Clare is a likeable character who quickly makes Jack a priority and to do this must reflect on her life and consider what will be best for this young troubled child with many special needs. Having worked in child protection in the past, I felt Scoullar creates a realistic (and somewhat cynical) picture of the system and how it affected Jack, his mother and Clare. There were some details that probably didn’t ring true but that didn’t affect my enjoyment of this fictional story. Clare’s love interest Tom, isn’t quite as well developed and fleshed out as a character as his heroine however I did like the simple, calming influence he had on Clare and Jack. There’s little conflict in the story for Tom in respect to his relationship with Clare which meant the romance didn’t have the emotional depth I’d expect in a romance story. My only other issue with the story was the complexities of the sub-plots as I felt there were too many issues being addressed in this one story and not enough space to explore them all. Not only is Clare faced with newfound parenthood, but her job is disrupted, she starts a new relationship with Tom, her grandfather is unwell and then there’s the mining company targetting their town that Clare also plays a role in. Nevertheless, most of these are all wrapped up satisfactorily at the end. Currawong Creek is a story just as much about the country as it is the city and the conflict faced by both ways of life that are explored through characters such as Clare, Jack, Tom and her grandfather. An enjoyable read from an Australian author that promises versatility. I look forward to seeing what she comes up with next.